We bring the best in technical expertise from our partner brands to you, so you can get answers to real questions from the very people who developed the products you work with every day. 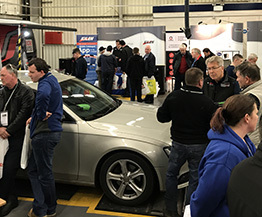 The MechanExpert Roadshow brings technical experts from LUK, FAG, INA, Kilen, KYB, Comma, Gates, Philips, Bosch, Apec, MANN + HUMMEL, HELLA, and HELLA GUTMANN SOLUTIONS to you, to share their insights with demonstrations and to answer your questions one-on-one. You’ll get up-to-date on the latest technology and get the inside track on best practices, common problems, and upcoming issues so you can be ready for ever more complex repairs as various technologies become more common and widespread in the motoring world.